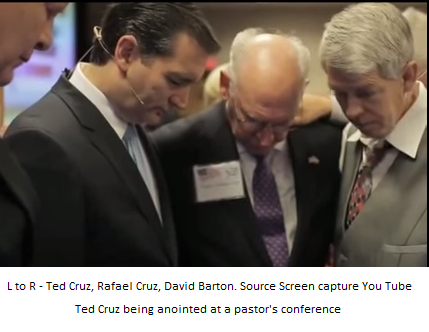 Ted Cruz Is Out: Did God Make A Mistake? One pitfall of claiming to speak for God is that God doesn’t always cooperate. Glenn Beck once said Ted Cruz had the best chance of winning the GOP nomination because God was on Cruz’s side. Now that Cruz has dropped out, is God disappointed? 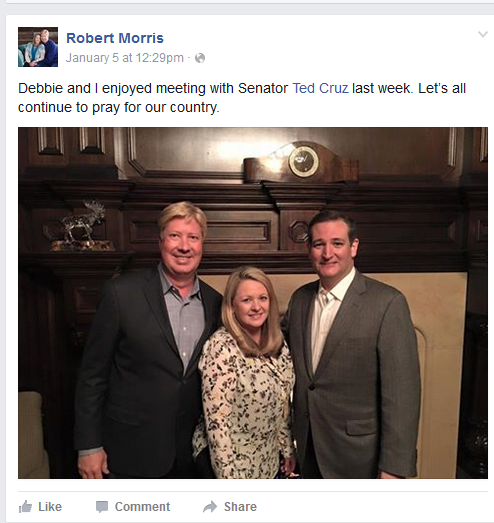 Beck wrote a post for his website where he downplays the fact that Cruz is out. What is happening in this election is normal. If you think it’s abnormal, you aren’t looking back far enough into history. Civilizations go through this. Societies aren’t a straight line of growth. There are down waves for every up wave. It’s another day where each of us has an opportunity to be a moral person. To defend Liberty. To protect our neighbor’s rights, and count on him to defend our own. No big deal. When Cruz was in the race, Beck and his fellow Cruz crew breathlessly reminded us that the nation was at the abyss, going to hell in a hand basket. Cruz was the answer. Now, tomorrow is just Wednesday. 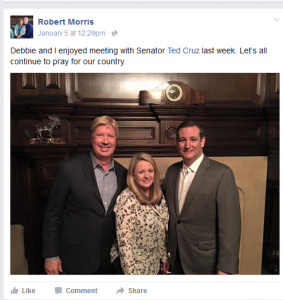 Author Warren ThrockmortonPosted on May 3, 2016 Categories history, politicsTags glenn beck, Ted CruzLeave a comment on Ted Cruz Is Out: Did God Make A Mistake? In Pennsylvania tomorrow, GOP voters will be confronted with a choice of John Kasich, Donald Trump, Ted Cruz, Marco Rubio, Jeb Bush, and Ben Carson. They also will be asked to vote for delegates to the GOP convention in Cleveland. The ballot doesn’t spell out which candidate each delegate has committed to vote for at the convention. Some will remain uncommitted and others might be persuaded to switch, making PA delegates very popular between now and the GOP convention. 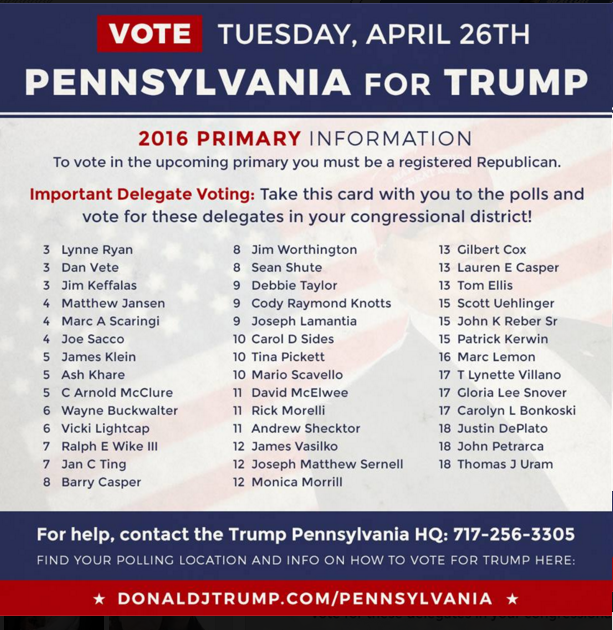 Political website PoliticsPA published a list of delegates who are pledged to Donald Trump. For those #nevertrump PA readers, this could be a handy help going into tomorrow. Trump has 41 delegates in 15 districts committed to him. According Former KKK Grand Wizard David Duke, Donald Neuhaus has pledged for Trump in the 14th District. He also has a handy list. One wonders where he got it. Here is something more official from the Trump campaign. Everybody makes mistakes. I certainly don’t expect presidential candidates to be flawless in their public statements. They speak constantly and answer questions on a broad spectrum of topics. They will misspeak. On the other hand, a consistent record of incorrect claims implies either lack of care for truth or an unacceptable ignorance when it comes to important issues. Motives are hard to discern but fact checking can get us closer to the truth. The folks at Politifact compiled a report card for the GOP candidates which I summarize here. John Kasich leads the way with over half of his claims (53%) being rated as true or mostly true. Cruz is a distant second with 22% being rated as true or mostly true. Trump is far behind with only 8% of his claims rated as mostly true or true. See the images below for the full report. If Trump gets the nomination, the GOP will reject the candidate who is the most factual, best liked, and most likely to beat Hillary in favor of the one who is the least factual, least liked, and least likely to defeat Hillary in November.